This 24-hour, all-inclusive hotel is located on fascinating Playa del Carmen beach. An oasis of comfort and service immersed in a luxuriant natural environment, it includes three pools, a children's pool, four restaurants, cocktail lounges and a swim-up bar. All rooms include liquor dispensers. 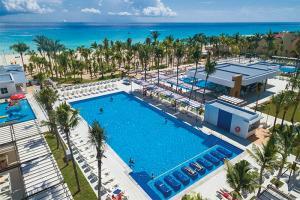 Guests enjoy exchange privileges with the nearby Riu Tequila and Riu Yucatan, excluding dinner restaurants. Located in the Yucatan Peninsula, 3 km / 1.8 miles from Playa del Carmen, situated on the beach within a hotel development featuring a 18-hole golf course. Mexican Street, next to Riu Yucatan, 100 m / 110 yards to shopping center, 55 km / 34 miles to Cancun Int'l. Airport. San Felipe Fort, Chetumal Museum of Maya Culture, Chacambacam, Bacalar, Golden Crocodrile Cenote, Chichan-Ha, and Huay-Pix.